While the orzo is cooking, heat the olive oil in a skillet over medium heat. Add the onion and cook, stirring often, for 2-3 minutes. Add the mushrooms and cook, stirring occasionally, for 3 minutes. Add the minced garlic and crushed red pepper flakes and cook, stirring constantly, for 1 minute. Remove from the heat and season with sea salt and freshly cracked pepper, to taste. Add the cooked and drained orzo to the onion and mushroom mixture along with a bit of the cooking liquid, if needed, and stir until well combined. Add the parmesan cheese and mix well. Taste and season with sea salt and freshly cracked pepper, if needed. Spoon the orzo into the tomato bowls evenly. Top with some mozzarella & a bit more parmesan cheese. Put the the tomato lid on top. Place the baking dish into the oven and bake for 30-35 minutes. Remove and serve topped with fresh basil and extra parmesan cheese on the side. Enjoy! 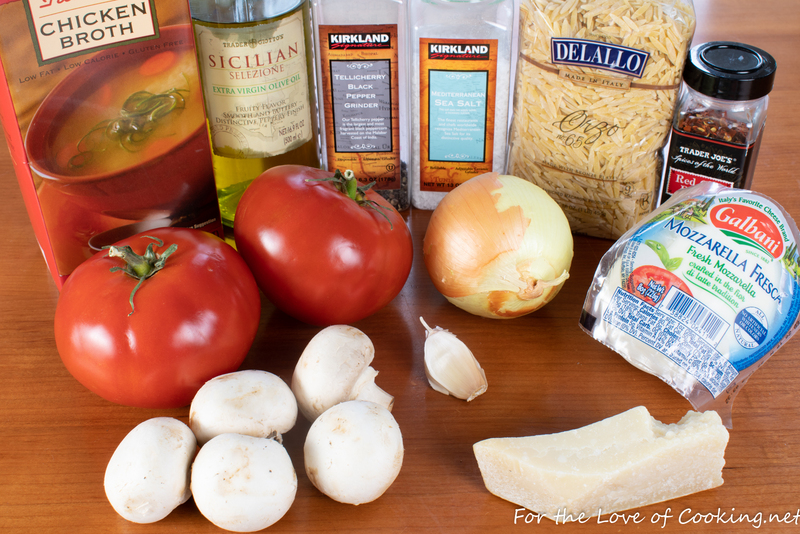 While the orzo is cooking, heat the olive oil in a skillet over medium heat. Add the onion and cook, stirring often, for 2-3 minutes. Add the mushrooms and cook, stirring occasionally, for 3 minutes. Add the minced garlic and crushed red pepper flakes and cook, stirring constantly, for 1 minute. Remove from the heat and season with sea salt and freshly cracked pepper, to taste. Add the cooked and drained orzo to the onion and mushroom mixture along with a bit of the cooking liquid, if needed, and stir until well combined. Add the parmesan cheese and mix well. Taste and season with sea salt and freshly cracked pepper, if needed. 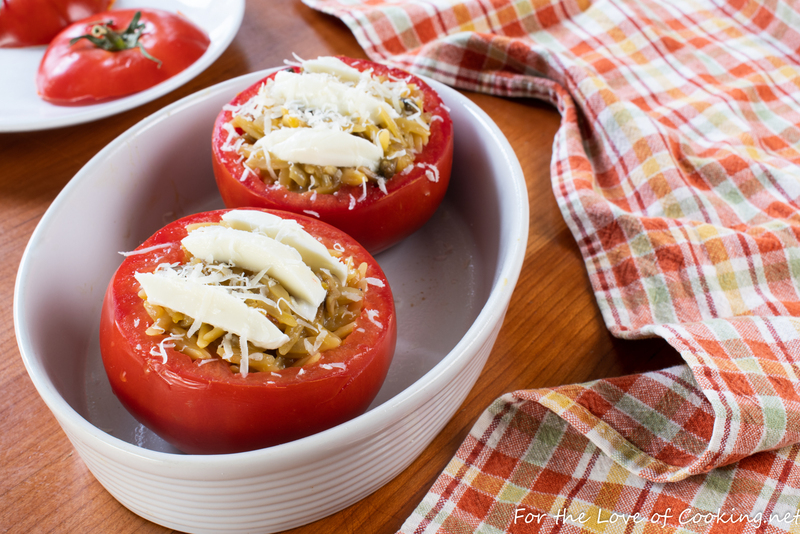 Spoon the orzo into the tomato bowls evenly. 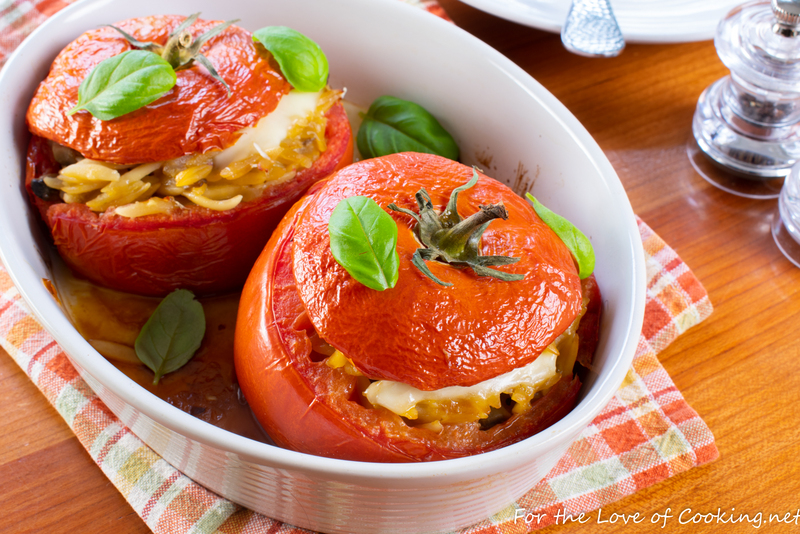 Top with some mozzarella & a bit more Parmesan cheese then put the tomato lid on top. Place the baking dish into the oven and bake for 30-35 minutes. 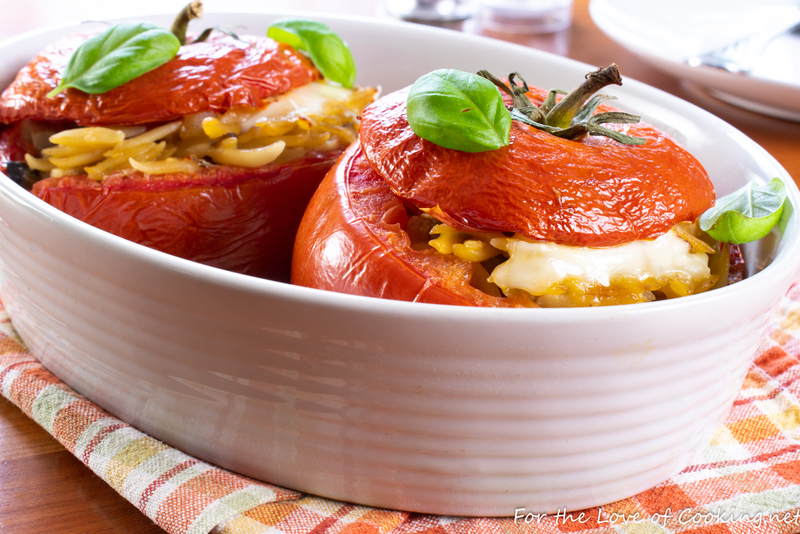 I always love stuffed veggies! This makes a perfectly healthy and delicious lunch. This looks really good. Have to try the orzo stuffing. 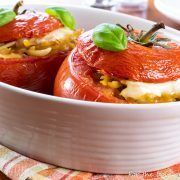 I can’t wait until tomatoes are in season here to try this!